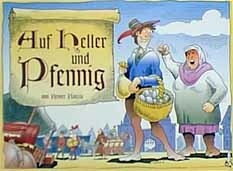 Auf Heller und Pfennig is an abstract board game with a loose medieval market theme. The theme could just as easily been prairie dogs or space colonies, but in this case the design and artwork (Franz Vohwinkel?) are cute and enjoyable enough to give the game good replay value. Since the game lasts about 30 minutes, less if you are quick at the arithmetic in scoring the board, this is a great filler game while waiting for friends or a great introductory game for gaming with less-sophisticated gaming friends. The mechanics of the game are simple. The medieval market consists of 6 rows and 5 columns. On each turn a player gets to place a wooden market stall disk or a tile which is chosen at random from a pile or played from a secret tile selected at the beginning of the round. The market stall disks are marked with a number 1 to 4 which multiplies the stall's scoring value. The tiles consist of customers in the medieval market and 4 special tiles which affect the scoring of the board. The customer tiles, each with a delightful charicature which greatly enhances the value of this game, come in good and bad flavors, ranging from the good and powerful King and Queen (positive 6 points), to the good and weak Farmer and Maiden (positive 1 point), to the bad and weak Beggar (negative 1 point), and bad and powerful Tax Collector (negative 6 points). When the market is full of market stall disks and tiles, the round is over, the board is scored. Three rounds make a game. The board is scored by totalling the value of each player's market stalls. Each stall scores the value of the customers in its row and column times the number on the market stall disk. So, if the Knight (positive 4 points), the Citizen (positive 3 points), and the Quack Salesman (negative 2 points) are on your row (netting 5 points), and the Beggar (negative 1 point) and Evil Tax Collector (negative 6 points) and Abbess (positive 5 points) are on your column (netting negative 3 points), a 3 point market stall scores 6 points (3 times 5 minus 3). The big ticket stalls (numbered 2 through 4) are discarded, while the cheap stalls (numbered 1) are returned to play in the next round. The market stall score is further influenced by the aforementioned special tiles: 2 fire tiles block a row or column and break up the rank (a good attack to separate your opponent's stalls from their good customers), 1 money bag tile doubles the value of the rank, and 1 evil-eye tile scares away all good people in the ranks. These tiles all greatly enhance the play of this game by allowing some dirty skullduggery in the market place. So, now let me offer some criticism and enthusiasm for the game. First of all, adult gamers may find the money counters entirely uneeded. Sure, for kids the money counters are fun, but when I play Auf Heller und Pfennig , I like to use a simple pad of blank paper to record each score. This saves time and allows intermediate calculations to get the score correct. Using the money disks is akin to scoring a Scrabble game with Monopoly money -- entirely unneccesary. Which leads to my second related criticism, the scoring tends to slow down the otherwise light and flowing rhythm of the game. Up until the scoring, players have been strategizing and planning, attacking and defending, and then suddenly the board fills up and the game comes to a brief halt while the arithmetical genius figures out everyone's contribution. An offical score pad or computer version of this game would greatly enhance the scoring, perhaps by highlighting each market stall and showing a quasi-spreadsheet view of the row and column score. Then, each stall row and column score gets tallied into a grand total. We have devised all sorts of devices to help calculate the score correctly and quickly. First, each player turns over each market stall disk in turn, and annouces the row and column score. On a score sheet, the statistician records the row and column score, the stall value, and the score sub total. Then, the sub totals for each stall are tallied into the round total for the player. Using this little ritual, we can see the biggest scoring stalls, and the biggest scoring players as the game progresses. Graphing and highlighting these scores is on my wishlist for the computer version of the game (dream on). Those scoring nits aside, other gripes include the random selection of tiles for each player - it increases the fun for children, but leads to random games for adults. This sort of random draw drastically reduces the strategic decisions one can make. Steffan O'Sullivan proposes three less random variant rules for the game. I especially like the third variant, where each player draws all his customer tiles at the beginning of a round. Much like having your market stalls available on any play, a fixed set of customers allows players to plan attacks more deeply and figure the ending to a round with more detail. Another way to reduce random tile drawing is to divy up the customers by equal-value customer points. Since there are 42 points of good customers and 21 points of bad customers, divide these values by the number of players and hand out customers accordingly. My final criticism is that placement strategies in this game can tend to be mechanistic. In each play a person should maximize one's own gain, while increasing an opponent's losses. When playing a customer tile, one can analyze all available places and figure the potential gain and loss for the play. Doing this for each open space, one can figure the best play In fact, a customer tile is not needed to figure the good placements. Assume you have the 1 point Farmer tile and figure the best net score for the open squares (again, a computer or math wizard would be good at doing this). This customer tile score can be balanced against placing a market stall in one of the open spaces. If it is a whopper of an open space, for example the King and Queen and Bishop and Abbess are visiting, go for it with your biggest market stall. Sounds mechanistic, right? Unfortunately all this strategizing is blown apart by the random selection of your next tile. Despite all my gripes, I really do enjoy the game. The randomization effectively limits the strategizing (much in the way the cards of Knightmare Chess turn a nearly pure strategy game into a fun rock 'em sock 'em beer and pretzels game) and help keeps the game moving along. Since the game is short, several can be played in an hour. As in any Reiner Knizia game, the options are many, but the resources are few. There are always many more possible plays than can be done effectively with the resources on hand. Released in 1994, it is interesting to see the genesis of one of Knizia's trademark game mechanisms, tile laying, which he uses to good effect in later games such as Tigris and Euphrates , Dürch die Wueste , and Samurai . Good job, Knizia! Last modified: Thursday, 09-Jun-2011 12:36:36 MST.